Curious? Take a look . . . .: UFOs IS THERE ANYBODY OUT THERE . . . Curious? Take a look . . . . I am not a scientist I just love SPACE, UFOs, CROP CIRCLES, TIME TRAVEL, its all here ! ! UFOs IS THERE ANYBODY OUT THERE . 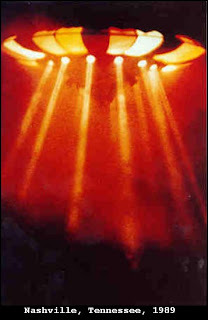 . .
(4) UFOs, Unidentified flying objects!! We all presume when we hear the word UFO that it must be extraterrestrial, but as we all actually know, it just means Unidentified! Or does it? From looking into the phenomena of UFOs, I have found a startling amount of evidence to suggest we have been visited by extraterrestrial UFOs for a very long time. When UFO sightings are reported, the majority of them can be explained, but there are about 29% of sightings that cannot be explained. Most of these reported sightings come from pilots, astronauts and cosmonauts. Why would we disbelieve them? These people are very highly educated, they are not attention seekers or mentally disturbed in any way. So why don't these reports get taken seriously? I don't know the answer to that, I can only presume that until you see a UFO with your own eyes then it can be hard to take the word of someone else. The reports probably are believed, but what can anyone do! I suppose it's a case of, "Thank you for reporting it, there's nothing we can do so we'll now file it away!" The X Files comes to mind. Believe this though, there are a lot of X files out there, some of which I will talk about here and if you are not a believer already, you will be after reading this blog, if you are still a non-believer then you are one of those people who will only believe it, when an alien comes up to you and taps you on your shoulder and says "Hi Earthling". There is one famous sighting which occurred over the skies of Phoenix, Arizona, USA on 13th March 1997, named the Phoenix Lights. This UFO sighting was seen by thousands of people, including the Governor of Arizona, who denied seeing it at the time, he even mocked the reports as ludicrous. He has come forward since and admitted that he did see the lights that night. He didn't admit it at the time, he claims, as he didn't want people to panic, but I suspect it was more to do with not wanting to be ridiculed. Which makes sense. 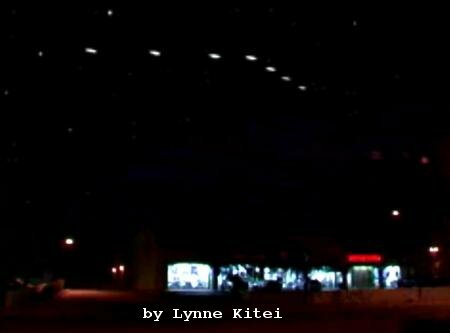 These lights were also seen over Nevada and the Mexican state of Sonora. The lights were described as being in a triangular or V-shaped formation that were underneath a massive, V-shaped, black craft unlike anything that anyone had ever seen before. The United States Air Force tried to explain away the reports as flares dropped by A-10 Warthog aircraft that was apparently on training exercises at the Barry Goldwater Range in southwest Arizona. I think the problem with that explanation is:- flares fall downwards and don't float across the sky as over 10,000 people reported. The lights traveled for hundreds of miles, flares don't travel that far. Another question comes to mind, wouldn't you think the people of Arizona would be used to seeing flares being dropped, seeing as the 'dropping of flares' has been going on since 1941? Also, who would drop flares over a populated area? So, I think that excludes that theory. Another explanation for the lights that appeared that night, was a top-secret Military craft. Again, there are a lot of flaws in this explanation. If top-secret, then why fly at low altitude over a populated city so that thousands of people can see it? Why not fly over the hundreds of miles of empty desert around Arizona? Also, every airport in the country (USA) is surrounded by a Class B airspace, a protective zone, no aircraft including Military aircraft can enter Class B airspace, without communication and clearance from air-traffic control. What flew over Phoenix on 13th March 1997, clearly violated Class B airspace when it entered without communication and clearance. It also violated minimum safety altitudes requirements and flew across one of the busiest airports in the country, undetected by radar. Go figure!! In my opinion, this was not an Unidentified Flying Object, it was an Extraterrestrial Spacecraft. Buzz has never claimed it was an alien spacecraft that was travelling alongside them, on the way to the moon. All he is claiming is that something was there, it was unidentified and is still unidentified. Many astronauts and cosmonauts have seen unidentified objects in space. Here is some footage from NASA's secret transmissions. Watch for the interest around the MIR space-station, plus lots of other activity just above the earth. Another interesting account of UFOs comes from retired Air Force Captain Robert Salas. He claims that on 14th March 1967 whilst on duty as Deputy Missile Combat Crew Commander at the Minuteman ICBM site, 85 miles from Malmstrom Air Force Base in central Montana, a UFO was sighted at the facility by the security guards. Robert Salas took a phone call from a frightened guard above ground. The crews manning the missile facilities were assigned to duty shifts where they were locked underground for 24 hrs. On this morning there were two guards above ground, they had received a phone call to say that something unidentified had been seen above the facility and to keep a look-out and report anything they see. Some time later the security guards did witness something, a 40-foot saucer-shaped object pulsating with a red light. They saw most of the missiles they had under their command suddenly go offline. Later it was discovered that the targeting systems were the only components affected. The guard immediately reported it to Captain Robert Salas. Captain Salas immediately went over to his commander, Lt. Fred Meiwald, who was on a scheduled sleep period. Salas woke him and began to brief him about the phone calls and what was going on topside. In the middle of this conversation, they both heard the first alarm klaxon resound through the confined space of the capsule, and both immediately looked over at the panel of lights at the Commander’s station. A ‘No-Go’ light and two red security lights were lit indicating problems at one of the missile sites. Lt. Fred Meiwald jumped up to query the system to determine the cause of the problem. Before he could do so, another alarm went off at another site, then another and another simultaneously. Within the next few seconds, they had lost six to eight missiles to a ‘No-Go’ (inoperable) condition. Robert Salas said that the only thing that might be able to affect the heavily shielded electronics (which were robust 1960s components, not fragile silicon circuits) was a very strong electromagnetic pulse. He knows of nothing then or now which could penetrate the underground facility, much less selectively shut down the targeting systems of so many missiles at once. Another UFO appeared over a nearby facility on the same night, with similar results. The Boeing company, who built the affected components, conducted tests to try and reproduce the shutdown incident. Nothing conclusive was found, apart from a very specific pulse sent to one of the logic circuits, which worked 80% of the time it was tested. How this sort of electrical impulse could be sent to such a specific component at the same time to so many missiles was never determined. This is not the only incident of UFOs being spotted in the skies above missile facilities and for missiles to be disarmed. One of England's most significant Military UFO sighting happened at Rendlesham forest in Suffolk on three consecutive nights in late December 1980. On this particular night, US Air Force security patrolmen John Burroughs and Budd Parker where by the east gate of RAF Woodbridge. They spotted a strange craft and at first thought it was an airplane about to crash, but soon they realised that the craft was hovering downwards and eventually landed in the woods. They could see a pulsating mass of coloured lights, described by witnesses as looking like a Christmas tree. John Burroughs quickly phoned the base. It was 2 o'clock in the morning and there should not have been any aircraft in the vicinity. Within minutes, security patrol Sergeant Jim Penniston was on his way by jeep, driven by Herman Kavanasac. When they arrived they too saw the strange craft. They could see lights flickering through the trees. Jim Penniston, who took command, tried to persuade Burroughs and Parker that a plane had crashed and was blazing out of control, but the two patrolmen knew that what was out there had landed and not crashed. Budd Parker stayed at the gate while the others went into the forest. There was some kind of strange electrical field pervading the woods, the radio contact with the base began to break down. Jim Penniston ordered Kavanasac to stay back near the road so they could use him to relay messages to the main base. Penniston and Burroughs continued deeper into the forest, it was at this point that the air became alive with energy, crackling as if within a thunderstorm, even the hair of the men stood on end, and their skin began to tingle. Jim Penniston has said since the incident, "It was definitely not in the Jane's book of World Aircraft". He described it as a conical object about the size of a small car, floating on beams of light (others reported seeing thin legs) only 30 cms or so above the ground. It had a strange, misty aura and on its side were black marks that could have been writing. As the men tried to get closer to the object they described it as like trying to walk through treacle, as they could not seem to close in on the object. Suddenly, there was a flash of light and the craft soared up into the air. Penniston and Burroughs claim they came close to an object that was like nothing they had ever seen before. As Airman (later Sergeant) John Burroughs insisted, "I do not now whether this was some kind of machine under intelligent control or a fantastic natural phenomenon, some rare kind of energy. What I do know is that it was nothing mundane. There are no words that can adequately describe the wonder of what we saw". The following morning signs of the UFO's presence were found in the forest. Many trees had their tops broken and three holes were found in the frozen soil in a triangular formation, matching the location of the legs seen beneath the UFO the previous night. An A-10 plane which flew over the site at dawn picked up infra-red radiation pouring from the forest. That night there was an officers' party at RAF Bentwaters. Lieutenant Bruce Englund came into the room and told the base commander Ted Conrad that 'it' was back. As Conrad was just about to present an after-dinner speech, he asked his deputy, Lt Col Charles Halt, if he could sort out the matter. Deputy Base Commander Halt (later promoted to Lt Col Halt) gathered a team of skilled men, including Sergeant Nevells of the 'Disaster Preparedness' team and took a Geiger counter to measure radiation. Halt also took a dictaphone to help him make notes. Englund gathered some gas-powered arc lights and the small party of men ventured out towards the edge of the base. A security cordon was set up around the perimeter of the woods to prevent any curious airmen or local villagers from getting in the way. An hour earlier a security patrol had spotted strange lights floating in the sky above the forest, but these lights had quickly disappeared. On entering the wood, the colonel was told that the UFO was no longer visible. However, the gas lights seemed to keep cutting out and he had to send someone to get more from the base. The team's radio communication both to the base and with each other were showing static interference, similar to that experienced the night before. Burroughs, hearing what was happening, decided to join the null but there was nothing unusual to see, except for a few stars and the pulsating light of the Orford Ness lighthouse and the Shipwash lightship further to the south. The men took several soil and tree bark samples as well as making radio observations of what they found. Out of nowhere all hell broke loose. Noises could be heard in the background as Halt cut in sharply telling his men to 'slow down' and take it carefully. The UFO was back! It had been spotted at 1.48 a.m. by a group of men who had ventured deep into the forest, which included John Burroughs and Sergeant Adrian Bustinza, who describes how the glowing light rested on a pillar of yellowish mist and split in the middle like a rainbow produced by a prism. Halt and his team had spotted the craft by now and said he initially considered mirages or weather-induced temperature inversions. Now the area of light resembled a huge eye with a dark centre. The group of men followed the light through the woods, crossing a farmer's field and stumbling through a small brook. They chased it for more than an hour when, suddenly the object shot skywards, Halt reported, "Now we observe what appears to be a beam coming down towards the ground, this is unreal". Soon after, tired and wet, Halt led his men home. 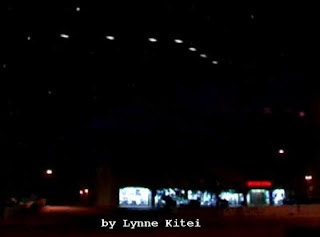 Strange lights were still seen above the Woodbridge base, flashing laser-like beams down into the security area of the base. Hundreds of personnel were said to have witnessed them. Local residents, such as Sarah Richardson, whose bedroom overlooked the base, saw them too. She later described them as "bands of rippling colour". Files detailing the Geiger counter readings taken at the scene were shown to experts by Nick Pope in 1994 who assess radiation levels for the government. According to Pope, they expressed surprise at the recordings and confirmed that the figures were ten times the expected background levels. Suspicion centered on the presence of nuclear weapons at RAF Bentwaters, which was denied by the base and the British government at the time. More than a decade later, it was admitted that this denial was untrue. By the end of 26th of December, US Deputy Base Commander Charles Halt and his British liaison officer, Squadron Leader Donald Moreland, were in discussions with their respective governments. A 'stand-up' meeting involving senior staff was held, and it was decided not to make any public revelations about the case. Soon, top-secret flights were arriving at the twin bases of Bentwaters and Woodbridge and staff from covert US Intelligence agencies were involved. Officers Burroughs, Penniston and the other witnesses, were cut out of the loop. So too were senior personnel at the base, even Deputy base Commander Charles Halt was not allowed to know what was going on. Had the cover-up begun? The official explanation was that the lights the men saw came from the lighthouse beacon. There are lots of reports similar to the ones I have talked about here. There is mounting pressure from governments around the world, including Britain, for the American government to come clean and admit to Extraterrestrial UFOs. They have known about this for more than 60 years, but do not want to share their findings with the rest of the world. After the Roswell incident, Edgar Hoover FBI, wrote to the American military and asked them to hand over the craft that had crashed, but the military refused. Even the Bureau couldn't get their hands on 'it'. Hoover was informed that the “disc and balloon” were “being transported by special plane for examination” to Wright Field. Very strange in the wording of this message, which came from a man called Agent Wyly (with information related to him by the Army Air Force) and continues that it was reported to have resembled “a high altitude weather balloon with a radar reflector – but that “telephonic conversation had not borne out that belief.” Very curiously, this last line is omitted entirely from the 1990s Air Force Roswell Report debunking the event. Other countries around the world admit to UFOs. China close their airports when UFOs are hovering above and openly announce the fact that planes have been grounded due to UFO. Mexico openly admit to UFOs, they have seen fleets of crafts in their skies. There are other life-forms out there, without a shadow of a doubt and one day we will all know about it. Look out for my next post on Crop Circles, a fascinating phenomenon. I leave you with one final video of a man called Robert Lazar, the whistleblower from Area 51. He claims to have worked at Area 51 or rather a few miles from there, in an even more secret location than Area 51. There he says he worked on one of about eight or nine extraterrestrial space-crafts that are at this location. He describes the craft, how it works, everything. What he describes fits in with everything we already know, the radiation, the micro-waves, which also relate to the crop circles. It's a truly eye-opening interview. Here is an incredible interview from Thirdphaseofmoon with Dr. Edgar Mitchell, who flew as Lunar Module Pilot on the Apollo 14 mission. He states that during his time with NASA he knew several people stationed at Area 51 including Robert Lazar, in direct contradiction of statements by some personnel known to have worked at Area 51, who claim that they had never heard of Bob Lazar. Dr. Edgar Mitchell also mentioned that it was apparently common knowledge (presumably amongst the US Military) that UFO's routinely visited and disarmed multiple nuclear weapons sites between the 50's and the 70's. Wishing you many happy returns on your 83rd birthday Dr. Mitchell, and many more to come.